Coconut is the sacred fruit offered to God in almost all Hindu rituals. Its fragrance is pure, rich with smell of natures' bounty. We provide coconut flavored incense sticks prepared by us according to the traditional Indian custom of incense making. Available in varied sizes, this range of Coconut Incense stick is the best way to impress God. Looking as if, all your wishes are coming true! We are definite that you will love to gulp every bit of its fragrance. We have made this coconut fragrance incense stick using premium combustible material along with essential oil and flowers. 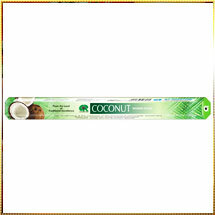 Furthermore, we offer these coconut incense sticks in an fancy packaging grabbing attention of all.